Acne Treatments - TheSpecialist Skin Clinic in Cardiff Brigend. Acne treatments are a route many individuals take as a way to keep their acne at bay and their skin looking its best. Acne affects 5% of woman and 1% of men over 25 and therefore it is not a condition solely reserved for teenagers and young adults as many assume. Acne treatments help to improve the appearance of your acne and those provided by specialist dermatologists can often achieve better results than over-the-counter acne specific products. If acne is affecting your confidence there are a number of Acne Treatments available. Acne is a common skin condition that affects many men and women. It is not age specific but it more commonly affects those in their late teens and early 20s. Acne can appear on the face, chest and back and severe cases can cause low-esteem and a drop in confidence. What are the different types of acne treatments available? There are a number of different acne treatments available such as those applied directly to the skin, oral medication, Isotretinoin capsules and laser treatments; all of which are proven to provide noticeable improvements to skin with acne. Which of the acne treatments is right for me? With many different acne treatments available, your skin type will be taken into account when the best course of treatment is decided. This is something one of our qualified experts can advise you on. How long do acne treatments take to work? As everyone’s skin is different and cases of acne can vary in severity it is difficult to say how long a treatment will take to work without an initial consultation. Some people may see an immediate improvement whereas others may require further courses of treatment. In your initial consultation your dermatologist will be able to advise you further. Who will perform the acne treatments? 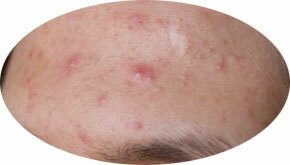 Acne treatments are performed by one of our qualified experts and supervised by Dr. Gonzalez. We will assess your skin to create a treatment plan for you. Exact prices to be confirmed during your medical consultation for your Acne Treatment.